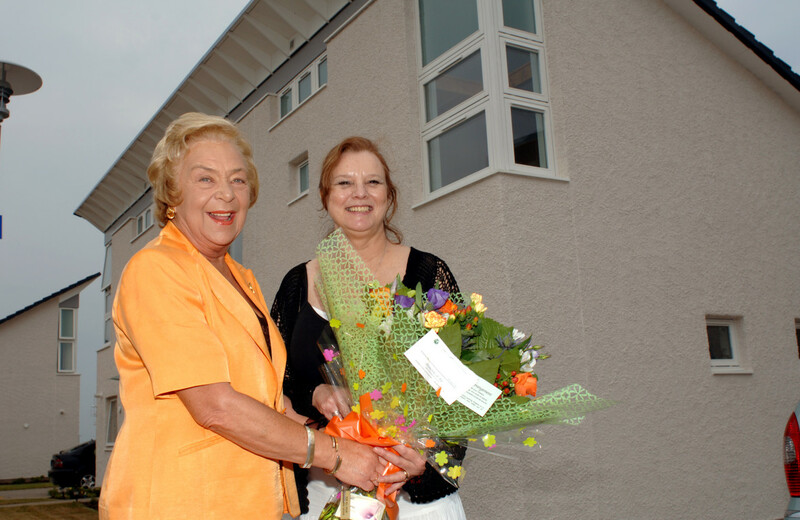 On 20 July 2006, Councillor Cherry Young (to the left in the picture) handed over the keys to delighted tenant, Sheila Fraser. Mrs Young said “It is a pleasure to welcome Sheila to her new home. It’s also great to see how the needs of other tenants leaving residential care are being met in an integrated and inclusive way”. This new development is now the first you see as you drive into Ayr on the scenic coast road. The 24 white rendered houses enjoy spectacular views of the Heads of Ayr and the Carrick Hills. The project includes 14 innovative patio houses each with its own internal courtyard. These are designed equally to meet the needs of disabled residents and their carers, and to be pleasant family homes. The development cost £2 millions and was supported by a grant from the Scottish Executive through Communities Scotland. This is the final completion in a multi-site project, designed by Roan Rutherford of Austin-Smith:Lord and built by CBC.